When Nathan and I first started looking at living life on the road. We looked into many different options. Last weekend we went to an RV show in Oklahoma City just to check out what they had. We made up our minds about 6 months ago what we want but after seeing what’s out there it has confirmed our choice. We haven’t bought our Airstream yet. As soon as our house sells, we will see what’s available used but we may end up buying new. 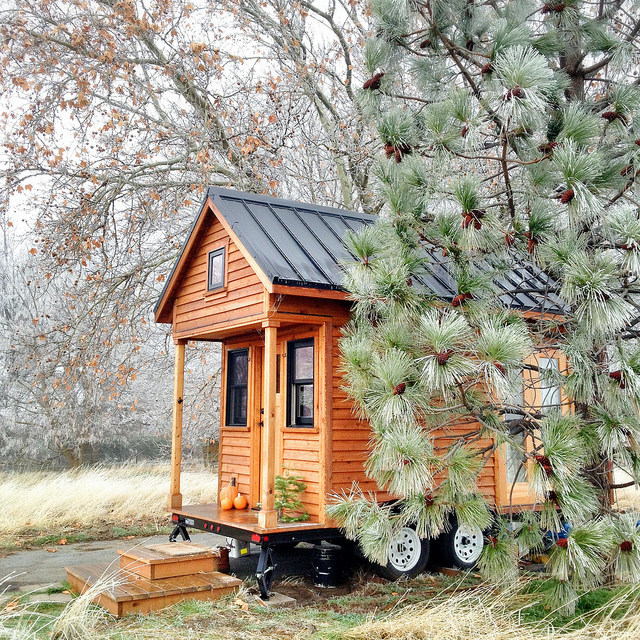 We thought about building or buying a tiny house on wheels but we want to move around more than they seemed to be built to do. Plus, not all communities are open to tiny homes, so it could potentially limit where we could go. We looked at all sorts of fifth wheels, motor homes (Class A, B & C) and travel trailers. There are some that have great features and are much bigger than an Airstream. A large majority of the options felt cheap, didn’t have enough windows or had absolutely terrible décor. Some of the interiors looked like they are a throwback to a 1980s cheap hotel. Motor homes are really out for us in general because if the truck needs to be serviced or we want to pop into town, it is much easier to park a truck instead of a massive RV. While vintage Airstreams can be remodeled into things of beauty, we don’t want a project right now. I like the layouts of the later model Airstream much better. It functions better. We love all the windows with the panoramic views being in the two most used rooms of the house: The living room and the bedroom. The weather and cross ventilation will be key to comfort. The interior is more neutral with nicer materials and smarter storage. It is true that we will have much less storage than other RVs but the whole exercise for us is to have less to take care of in order to be able to do more with our time. What do you think? We were of the same mind when we were shopping for our first RV. The showstopper for me was that I was too tall at 6’2″ for the bed and shower in the Airstreams we looked at. If it weren’t for that, we might have gone that way too. Looks comfy. Have you guys gotten a chance to break in the new rig? It looked super slick from the exterior photo I saw. Yeah, we’ve done a few trips into the mountains with it so far. The first one was in a blizzard with gusts to 80mph for a stress test – no problems. It definitely is much more minimal than our Lance was, but so light and compact that we can take it pretty anywhere the truck will go. Our priorities were maximum flexibility with this one, and it does that with plenty of comfort left to enjoy. Of course Ann makes it extra nice with things like candles and organized gear. We’re very happy with it so far!